This class is a challenging, college-prep, high school level chemistry class which covers properties of matter, the periodic table, specific heat, bonds, molecules, the mole, empirical formulas, oxidation-reduction reactions, chemical reactions, stoichiometry, equilibrium, concentration, state of matter, acids / bases, and introductions to organic chemistry and biochemistry. Students will turn in a minimum of six full lab reports as assignments on labs chosen by the teacher. Students will perform some labs at home with teacher direction. Other labs will be done virtually – students will have required lab reports on these labs also. 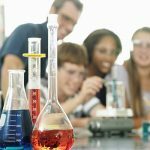 Importance will be placed on students’ understanding of scientific inquiry, the scientific method, and the resulting science lab reports. The Chemistry classes will meet live for one weekly, 90-minute online session to include lecture, discussion, assignments, and individual & collaborative activities in real time with the teacher and with classmates. While class attendance is not required, there will be assignments, activities, and quizzes held during class that failure to participate in could impact the final grade. It is not recommended (please communicate if you find conflicts) to attempt this class if you can only participate by watching the recordings unless you have a clear understanding of the limitations involved with that approach. Class participation and the opportunity to ask questions and interact with classmates is a significant part of ensuring that students get the most out of the virtual learning experience.